If you’re new around here, I started tracking my blogging income through these income reports in mid-2016. 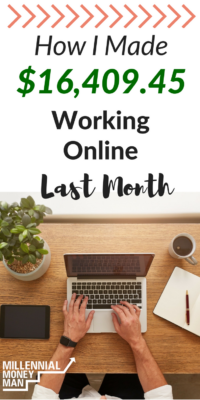 This is a great way for me to keep an eye on my progress of doing M$M full-time, and it’s also a great way for you to follow along as well if you’re thinking of starting an online business. It's already been so cool to see the progress and how much my life has changed over the past two years! I used to be a high school band director, which was basically what I had wanted to do my entire life. I had $40,000 of student loan debt that I hustled really hard on and paid off in a year and a half (you can read more about that here). Then, I got really excited about personal finance and started this site. I had NO idea what I was doing, but kept plugging away and eventually quit my job six months later to run M$M (which had basically made no money at that point haha). And now, here I am. I run an awesome online business and basically have found my passion in life. A lot of you have wanted to start your own blogs after seeing the success that I’ve had, and I highly recommend it. If I hadn’t taken a shot on M$M, I would still be stuck in a career I didn’t really end up enjoying very much. It takes time to build a business like this, but if you have talent and a good message/story, it is possible to do well. Take a look at my free blog setup tutorial. You’ll have your own blog set up in just 10-15 minutes, and will receive a lower website hosting price since you’re a M$M reader when you use my exclusive link. As a bonus from my family at Bluehost- you’ll also get a domain name for free ($15 value)! So far I’ve had 1,330+ people sign up for my blogging course since it debuted in February, and the reviews have been great! Even if you are just thinking about starting a blog or want to figure out how to get more traffic to the one you already have, this will be useful for you. Everything in the course applies to small business websites that have a blog as well, so there is good value for business owners out there that want more engagement on their sites. You'll learn how to start and run a successful and profitable blog! Success! Now check your email to confirm your subscription and start the free blogging course! Something to remember when you look at this income report – I’m self-employed and have to cover expenses, my basically useless health insurance policy (seriously it SUUUUUCKS), and taxes. That all comes out to roughly 30% each month. Ah October. That went by fast haha. Honestly though, I feel like every month goes by super fast at this point. I was sitting down trying to figure out what stood out with the business during this past month, and it was pretty hard haha! I've been recording my course and basically working 7 days a week to get all of my marketing work and content written for this site. Strangely enough…I haven't felt any burnout yet, but talk to me in December and it may be a totally different story! It's been a while since my wife and I have done a vacation, so once we get through the holidays we are going to have to go do something pretty cool to maintain the mental sanity. My first thought is Hawaii since we've never been, but I'd also love to go back to Anna Maria Island in Florida (which has low key turned into our future retirement spot). I do feel like I've hit a bit of a wall with my business as far as affiliate income. There are a lot of things I need to do for the site as far as optimizing old posts, doing more freebies for email leads, etc. to grow that aspect, but I just haven't been able to do it yet. On the digital marketing side of things, I actually have all the work I want. I'm at the point of turning down clients, which sounds crazy but I want to maintain a decent work-life balance. The surprising thing about blogging is that it just feels like it's impossible to get everything done when you want to sometimes! So I'll just keep slowly hacking away until I get some goals crossed off the list for the site in the next few months. I also have some BIG projects in the works that I think will take M$M to a completely different level. I've always believed that I can be on the level of a Pat Flynn from Smart Passive Income or John Lee Dumas from Entrepreneur on Fire someday, and I'm just now starting to see a path towards it. So for those of you that don’t know, I run a small digital marketing company from my laptop. I keep it capped at just 5 clients (some are seasonal, some aren’t) so I can also grow M$M and attempt to maintain a good quality of life. This has been a great source of income for me as I've continued to grow this site! Blogging professionally takes a lot of time, so for me having the steady revenue coming in while the site was able to grow a legitimate audience has been really helpful. Just FYI – the marketing course that I mentioned earlier (you really need to sign up for the waiting list if you’re interested in making steady money online) will cover everything you need to know about how I make money this way. Out of respect for clients’ privacy, I can’t name them on the site or list my rates for specific projects, but you’re always welcome to email me if you are an aspiring digital marketer and want tips or guidance! So I *think* that I've wrapped up the last bit of staff writing for the year. I've been working with one client for a while now, and fortunately, that relationship has been really good! They told me that they are basically out of budget for the rest of the year, but want to have me back again starting in January. It's actually a bit of a relief – the end of the year is going to be crazy with all the stuff I have going on. After I launch the Make Money Marketing course I'm sure I'll run into a ton of business-related issues that I've never had before. Also at FinCon, I talked with a pretty big brand about doing some additional staff writing. We'll see what happens there! Should only be a once a month type of gig, which would work well with my schedule. OK so I didn't really know this, but at the beginning of each quarter, ad revenue tends to be down just a little bit. Seeing how all of this ad stuff works is pretty fascinating. I've had AdThrive explain it to me before, and it seemed like a calculus equation haha! But as you can see in the chart below, I experimented a little bit with ad placement and saw a drop in RPM (revenue per 1,000 views) near the end of the month. As I move into selling courses throughout the end of this year and into next, I'd like to cut way back on the ads. I guess I could do it now, but it seems like it would be a little dumb to intentionally drop my revenue down significantly when everything else indicates that I should keep them. Overall, traffic was kinda all over the place day to day, but slightly ahead of last month. One area I'd like to improve is Pinterest (of course). I rolled with a new pin design a few months back, and it turns out that they aren't very popular. Instead of trying to make them “Pinteresty”, I tried to model them after the site's theme and probably overthought everything in the process. From now on, I will be using the most Pinteresty looking pins that you will ever see (and I also need to join some bigger group boards and tribes, so if you have any suggestions for quality ones to join I'd love to see them in the comments)! I don't know why, but in the past, I've always just waited for sponsorships to come to me. Based on the size and reach of this site, I should probably be making way more money this way than I have been over the past few months. One of my new blogging friends Alexis who runs Fitnancials.com wrote a KILLER post on getting sponsorships. If you're a blogger and want to figure out how to make money from your site with sponsors, I highly recommend checking it out. It has a ton of info, so personally, I bookmarked it so I can come back to it over and over again. Anyways, sending my media kit off to different companies was really helpful in October. It looks like I've also got a few sponsored posts lined up for November (hopefully?). Coral and I have been in the new house for about a month or so, and it's awesome! I thought that getting a mortgage was going to crush my soul or something because I've always been so debt averse, but I was shocked by the lack of buyer's remorse I had when we finished up at closing. We definitely made the right choice to get out of our apartment (there were roaches and it was super frustrating because we are VERY clean people). This will sound weird, but I'm not scared of mortgage debt the same way I used to be with my student loans. I know how to handle it, and I also know that in the grand scheme we bought a house that costs well below our means. We will probably take a bit of a hybrid approach when it comes to paying it off. My focus has very much shifted to investing, so I think we can pull off getting a good chunk of change invested every month while still paying the house down quickly. However, if I was still a teacher and didn't have any control over my income – I'd be throwing every extra cent I could at the mortgage. It's interesting how your perspective changes on these things depending on your financial situation and income. I met a lot of great people, did a ton of networking, and definitely felt like more of a “pro” at this Fincon compared to last year's conference. This will sound stupid, but I guess it hadn't sunk in that A) This is my real-life job, and B) A lot of people come to the site now. I had an awesome time meeting bloggers that were inspired by the site and just normal readers that were there for the conference. I did a Fincon 17 review, which you can check out here. The Make Money Marketing Course will be going to beta testing pretty soon! Once I'm done recording here shortly, I'll be sending out an email to everyone that's on the course wait-list to select beta testers. I'm going to pick 20 people that will have the opportunity to buy the course half-price. Then, they will go through the course, and I'll get as much feedback as I can from them and make tweaks to the content as needed before it goes out for regular pricing (which will be $197). I realized that I've been putting these weird arbitrary deadlines on the course (really just to motivate myself to finish it), but as we get closer here I need to take my time and put out the best product that I possibly can so that it really helps people make money with blogging. The idea behind the course is to provide the foundation for getting marketing work and actually help bloggers make money with the most common marketing services. Then, I'll expand my students' knowledge with seminars and advanced courses from experts that I'll bring in to the private Facebook group. Want to get really nerdy with local Facebook advertising? Cool. I'll bring in experts and pay them to teach you advanced strategies. Maybe we'll even work out special pricing for people in the private group for any courses that my experts offer to expand your knowledge. The potential with this thing is just unreal as I'm digging more and more into the finer details. So be on the lookout for an email from me if you're on the wait-list! This isn't BS – it's NEVER lost on me that I have an audience of people that come to the site regularly. I'll continue to do everything I possibly can to provide legit value to your lives. If you haven't joined yet, I highly suggest that you jump into the private M$M Facebook group here. I'm legitimately convinced that I accidentally created one of the best private personal finance groups on the internet. If you're interested in getting ahead with your money and want to find “your people”, the group is the place to do it! Where should Coral and I go for a vacation at the end of the year? Great month for you Bobby! Sounds like that staff writing is winding down at the perfect time to finish up some of the other things on your list. Looking forward to what you’ve got in store in 2018! Congrats on another great month! I love seeing your progress steadily increase from month to month. It’s definitely motivating me to keep going. I actually started making money from my blog as of September. It’s so awesome. Thanks for the tips and keep up the great work! Congrats on another solid month Bobby! I appreciate that you show such detail in how your display ad revenue fluctuates. I’m looking forward to your marketing course. There’s so much focus on affiliate revenue (obviously because it’s awesome) but there’s so much potential out there for bloggers to make revenue through services. Way to go on another good month! To answer your question, you should go to Hawaii! You’ve been thinking about it, just go! It should be a great time as it’s getting into whale watching season. You’ve been to the Caribbean and Florida, jazz it up and go to the west. Thanks! Yeah I’d really like to do Hawaii too, it’s just so easy to go back to what we know is good! Happy that you are enjoying your new home! And congrats on such an amazing month! I hope to build my affiliates to make that much every month. That’s fantastic! We just had a good first full month (9,262 pageviews) but that’s like a drop in a bucket compared to your numbers. We just linked this post in our monthly blog report so we can inspire our readers. Keep up the good work! Great income report. Always love reading your reports because of your writing style. I am really excited to see you continue to grow your blog. It’s crazy to think that a $15k month is just the start but I have no doubt in my mind it really is just the start for you. Also, your house looks beautiful! Judging by your Instagram stories you and your pup quite a lot of fun throughout the day. I can barely get our dog out of bed by 2pm hahaha. Glad you liked this one! I spent more time on this one than usual, which is what I should be doing. Got into a mode of copy/paste there for a while. If you had told me that it was just start two years ago I would have laughed, but honestly I think it really is. You keep killin’ it every month and I’m always impressed by the amount of income streams that you have. It’s impressive! Love reading your income reports, they are so helpful! P.S. You should go to Peru if you haven’t already! If you guys ever decide to, reach out to me. I lived there for 2 months and it was sooooo awesome!! Thanks! Of course – your post was great and really helpful. I’ve really sucked at getting sponsors in the past and didn’t even have a media kit. Congratulations on another great month! I’m still trying to figure Pinterest out, too, but I did have a couple pins go semi-viral and bring in a few thousand visitors I wouldn’t have seen otherwise. That led to a few new subs and some Adsense revenue. Now, if I could just figure out how to rinse and repeat with many more pins. What about heading to the Big Island of Hawaii? This blog post is motivating, thanks for sharing!